I’ve had the idea for this post popping in and out of my head for the last few years, so I’m glad I’m finally getting to share it with you today! It involves coffee, so naturally it’s very near and dear to my heart. 🙂 I’ve mentioned before that I used to run a branch of a certain famous coffee shop for about 10 years and during that time I definitely drank more than my fair share of peppermint mochas. And not just at Christmastime! No, no, I’m an all-weather peppermint mocha kinda gal. When I stopped working there, I did without for a few months, but then one day I realized just how much I loved the idea of good peppermint mocha. Or actually, an iced peppermint mocha. I think it was Summer at the time. So I did what most sane people do when they want to try to make a peppermint mocha at home. I made peppermint hot chocolate. I made coffee. And then I put them together. And added ice too. If you’ve ever tried that before then you know that it just isn’t the same. Actually, it tastes kind of wrong. Weird how that works out isn’t it? Well, luckily I had my thinking cap on so I came up with something that I think hits the spot pretty much perfectly. 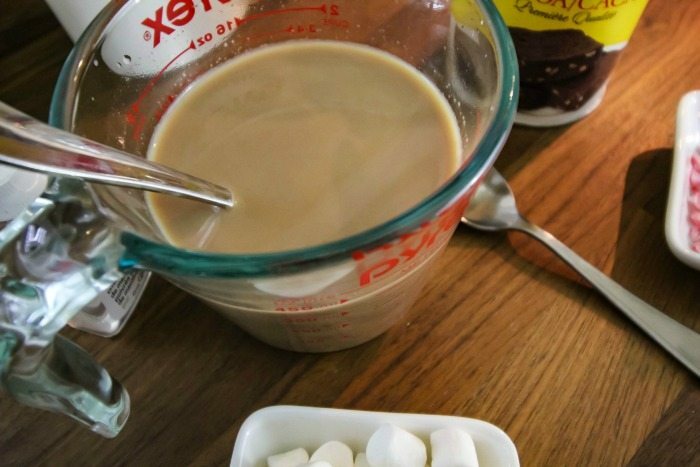 Of course, when I say that this is a recipe for a “coffee shop style” peppermint mocha, I know that all coffee shops have recipes that are slightly different but I think they all have a few things in common. First of all, they all have a nice little kick to them. The chocolate is usually a little on the darker side so you really notice that chocolate flavor, the peppermint is really cool and peppermint-y and you can still taste the coffee. Most importantly, all of the flavors are really nicely balanced so that they all stand up well to each other without ever being completely over-powering. And then of course there’s the whip cream. If you have a good barista, they’ll always give you a little extra, and I suggest you do the same for yourself. It’s Christmas! So here’s how I make my peppermint mochas for myself! I should also note that I don’t usually make my coffee in a measuring cup each day. I usually just make it in a mug but I wanted to make sure to get all of the amounts juuust right for you today. 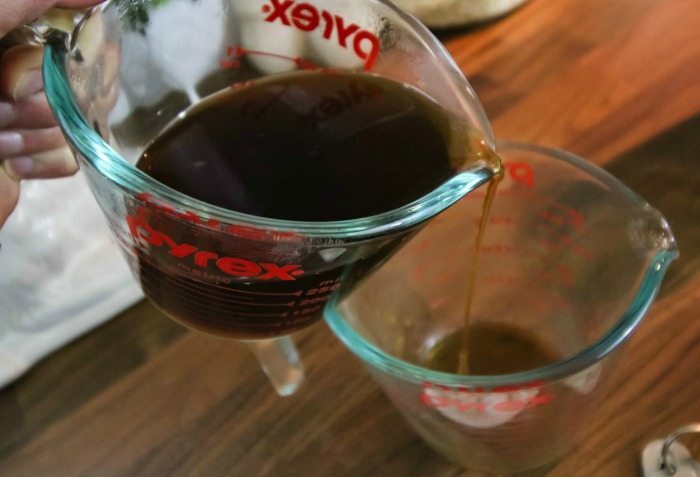 That way, if you want to double or triple the recipe to share with friends over the holidays, you can do that easily in a big measuring cup! Next, I add in about 2 teaspoons of sugar and 3/4 teaspoons of good quality cocoa powder. It must be done this way! No chocolate syrup or hot chocolate mix! 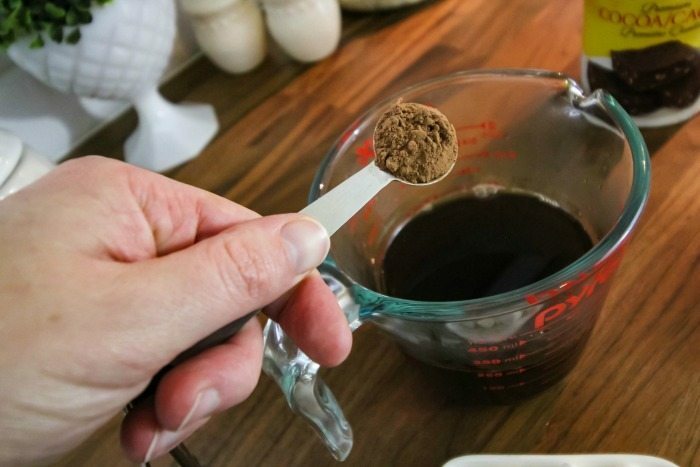 It makes all the difference to use the straight cocoa powder! Mix everything together really well so there are no lumps. Now it’s peppermint time! Add about 1/4 teaspoon of peppermint extract. This stuff is strong so feel free to add a little less if you like and then adjust after all the ingredients are added to balance the flavors. 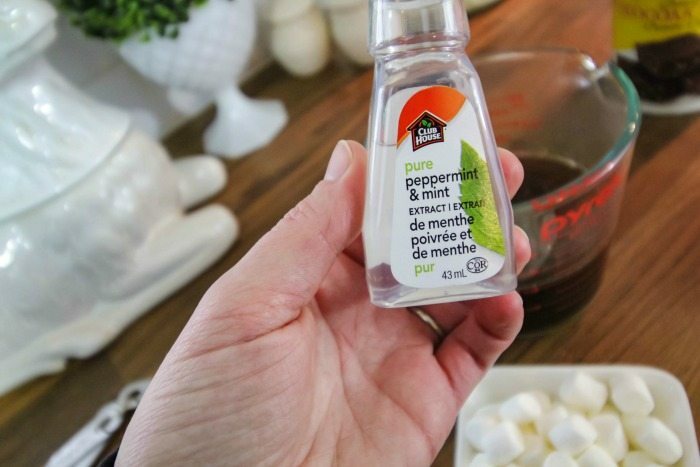 I feel like the peppermint flavor needs to be strong for a good peppermint mocha, so I add the full 1/4 teaspoon. Lookin’ good, isn’t it? Now quickly pour your peppermint mocha into the mug of your choice before it starts to cool off! 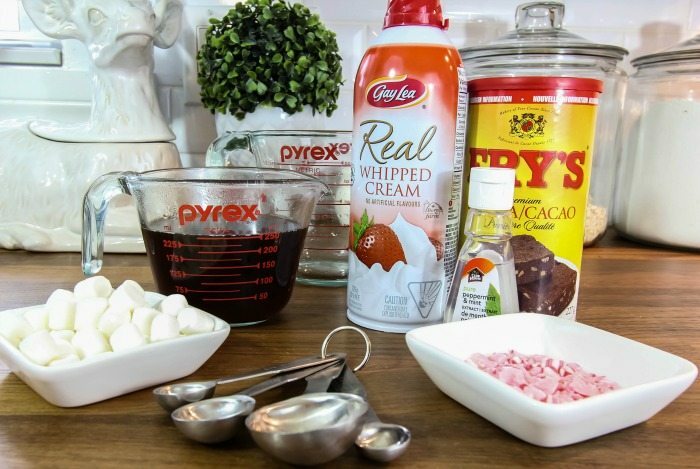 Make sure you top your peppermint mocha with whipped cream for a real coffee shop experience! If you aren’t sure about your whip-creaming skills, don’t worry! I’ll show you how! It’s really easy and it just takes a little practice to get the hang of it. The key to success is to start adding your whip cream about the outer edges of your mug first, creating a seal that stops the liquid underneath from bubbling up and making a mess. 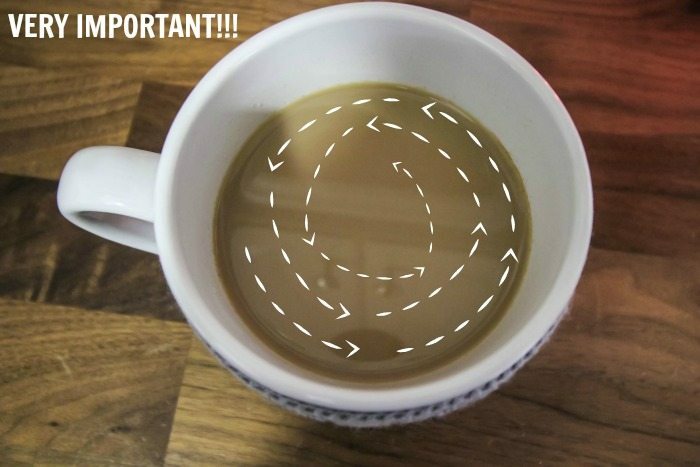 Then, you just slowly work your way inward and upward as you continue circling around the inside of your mug. At the coffee shop we always made whip cream from scratch using heavy cream and a bit of vanilla syrup, but at home I’ve always used Gay Lea Whipped Cream. It’s really important to me to have real whipped cream and not “whipped topping” and I’ve always liked the convenience of the Gay Lea whipped cream in the can, the fact that it has a built in star tip for pretty presentation and that it always tastes amazing! 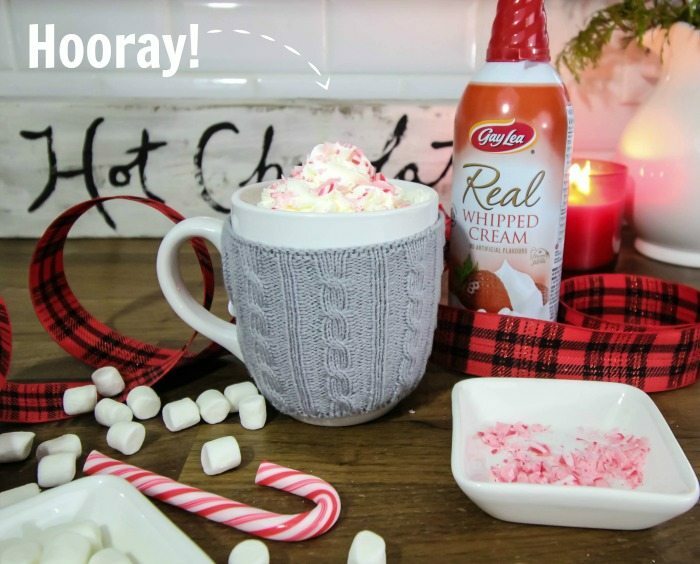 The fun thing about making your own peppermint mocha at home is that you can add your own fun toppings on top of your whipped cream and make it even better than the coffee shop ones! I like to go for mini marshmallows and crushed up candy cane pieces when I’m trying to be really festive. 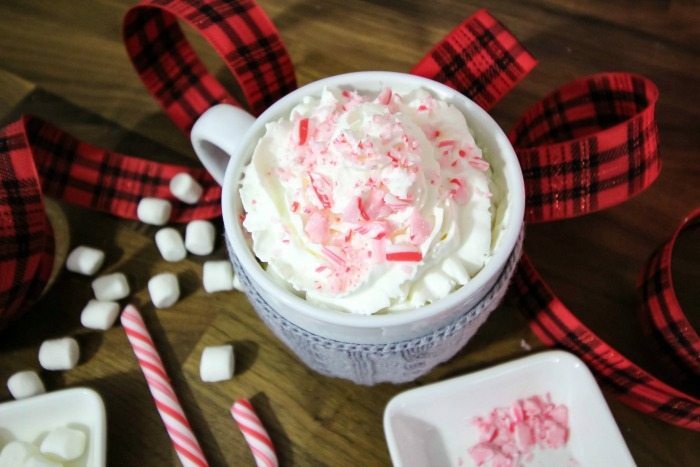 Give my peppermint mocha recipe a try though and let me know what you think! As if having the recipe for the perfect at-home peppermint mocha wasn’t enough, Gay Lea also has a pretty great little giveaway for you today as well! In celebration of Gay Lea’s 24 Days of Cookies promotion, they’ll be giving away an awesome grand prize to one of the lucky people who visit their 24 Days of Cookies contest page and “open” one of the little doors on the cookie advent calendar! 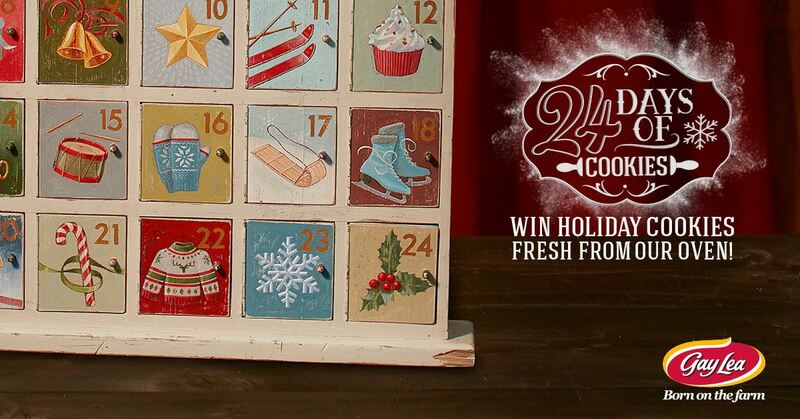 Each day, you can open a little door to reveal a new cookie recipe and be entered in the contest! You can even send a virtual cookie to someone and be entered to win a fresh batch of that day’s cookie delivered straight to you door! Pop by the website to check it out. It’s a really fun idea all on its own, and the grand prize is just the icing on the cake….er cookie! I created this blog post as a paid ambassador with Gay Lea Foods’ #BornOnTheFarm campaign and PTPA. All opinions and advice are my own as always! I have to try this! Being a tea drinker I am transitioning to coffee occasionally and anything peppermint I can’t get enough of!